With 46 million turkeys raised on inhumane factory farms and slaughtered for Thanksgiving across America, Farm Sanctuary, the organization dedicated to combating the abuses of animal agriculture and encouraging a new awareness and understanding about farm animals, is teaming up with Kaley Cuoco, Joaquin Phoenix, Kevin Smith and his daughter Harley Quinn Smith to encourage people to #BreakTheChain of old traditions by taking the turkey off their plate and sponsoring one instead through Farm Sanctuary’s 33rd annual Adopt a Turkey Project. In separate video messages, Cuoco and the Smiths explore the concept of tradition and how customs bring us closer, but can also bind us — especially in the case of eating turkey at Thanksgiving, as we see the impact that slaughtering millions of turkeys for a single holiday has on our health, planet, and future generations. As an easy first step, they suggest sponsoring a Farm Sanctuary-rescued turkey this Thanksgiving. Cuoco, Phoenix, and the Smiths are joined by 26 fellow influencers with a combined audience reach of nearly 50 million people. This year’s Adopt a Turkey Project social ambassadors include athletes (Torre Washington, Madi Serpico), models (Joanna Krupa, Sophia Miacova, Jayde Nicole, Tina Louise), celebrity chefs (Adam Kenworthy, Chloe Coscarelli), news personalities (Jedediah Bila, KTLA’s Lu Parker and Liberté Chan), mainstream YouTube and Instagram stars (Carli Bybel, Daniella Monet, and Yovana Mendoza), and many more. 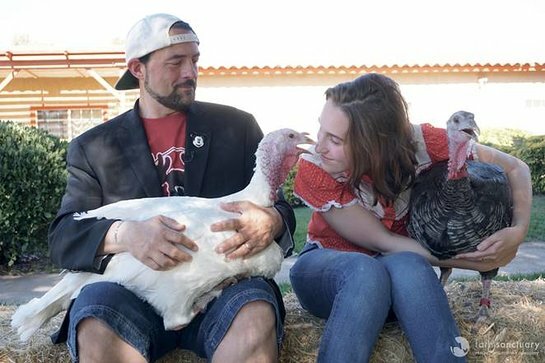 Since 1986, Farm Sanctuary’s annual Adopt a Turkey Project has led to the rescue of more than 1,000 turkeys from a brutal death and given thousands of people an opportunity to honor the spirit of the holiday by sponsoring rescued turkey residents and supporting lifesaving rescue, education, and advocacy work on behalf of billions of farm animals just like them. For a one-time donation of $35, you can symbolically adopt Farm Sanctuary-rescued turkeys, Bowie, Gerda, Perdita, Ruthie, and Spunky; or, sponsor the flock for $150. To learn more, visit adoptaturkey.org.